Part of the Emerald 4K KVM extension and matrix switching solution that simplifies access to both physical and virtual servers. Emerald™ is the first Enterprise KVM Extension and KVM Matrix Switching solution that delivers pixel-perfect video with 2K/HD or 4K/60 resolutions over an IP network. The flexible and scalable system supports any number of workstations and servers. In addition, it simplifies virtual access, making it easy for you to use any combination of physical and virtual servers. User’s working on the system experience fast and easy-to-use access to their target servers with premium video quality and a rich peripheral set supporting stereo audio and up to any four true emulated USB 2.0 devices including Wacom® tablets. Administrators will like comprehensive management with convenient configuration options in line with high-level security and reliable operation. An Emerald KVM network may start small, but it’s infinitely scalable to meet your expansion needs and future technology path just by adding endpoints, with no additional chassis or cards required. Emerald comprises of a choice of transmitters connecting computers or virtual machines to the system and receivers adding the user consoles. 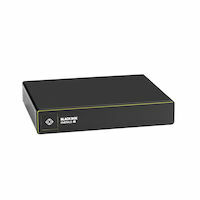 High-performance 12-, 28-, 32-, or 48-port Emerald network switches ensure trouble-free KVM over IP extension and matrix switching connections. A range of SFP/SFP+ transceivers proofs best performing video quality and KVM extensions over the required distances. 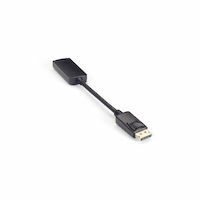 Use the Emerald units featured on this page to connect DisplayPort/HDMI and consoles with resolutions up to 4K/60, transparent USB 2.0 and audio to your Emerald system. Emerald makes your migration painless, enabling you to scale access infinitely and gradually across buildings, campuses and the wide area network, using your existing network infrastructure—with switching between sources at speeds of less than half a second. Emerald is the first KVM platform that supports pixel-perfect 4K DisplayPort video at 60 Hz over standard IP network switches using copper or fiber cable (SFP+). Image transmission with mathematical lossless compression visualizes every single pixel at 60 fps with 10-bit color depth. If you are not ready for 4K yet, start with the Emerald SE for options-supporting one or two full HD DVI channels with resolutions up to 1920x1200-and migrate to 4K at your own pace by transitioning individual user groups when the need arises. The more and more physical server is being replaced by virtualization allowing better performance, availability, scalability, and return on investment. Emerald simplifies access to both physical and virtual servers with virtual machine support for VMware, Microsoft, and Citrix, using RDP, RemoteFX and PCoIP, among others. All Emerald transmitters and receivers feature copper or fiber connectivity through two flexible SFP+ slots. Your 24/7 operation requires network resilience. Use the redundant network ports on the Emerald units to provide continuous, uninterrupted operation in the event one network experiences loss of service. Connect the endpoints either through two alternative direct links, a direct link and a network connection or two independent networks. For HD video, Emerald requires a standard Gigabit Ethernet network and possibly a 10 Gigabit aggregate switch, depending on how many endpoints you have. For 4K video, you’ll need a standard 10 Gigabit Ethernet network with a 100 Gigabit aggregate switch. For both, the network infrastructure required by Emerald can be built with IEEE 802.3 standards-based components from Black Box or other manufacturers. 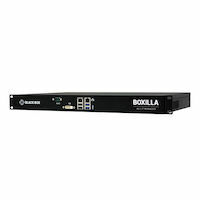 Emerald supports multiple ways to control the system: via the receiver’s OSD, X-keys, or external control system such as Boxilla™-our centralized KVM Manager. Emerald in combination with Boxilla enables timesaving, controllable presets and multi-user settings. You can also pool designated CPU resources, allowing for user selection by type of server/PC/desktop rather than by individual dedicated resource. Even more important, you can prepare for instantaneous recovery from disasters with one-click access to an entire backup control room in a different location. The KVM main control room configuration can be replicated anywhere you have a network connection. 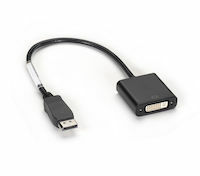 The 4K DisplayPort KVMoIP Extender RX Single-Head V-USB 2.0 Audio VMA comes with a standard 1 Year Double Diamond™ Warranty (Standard) already included.